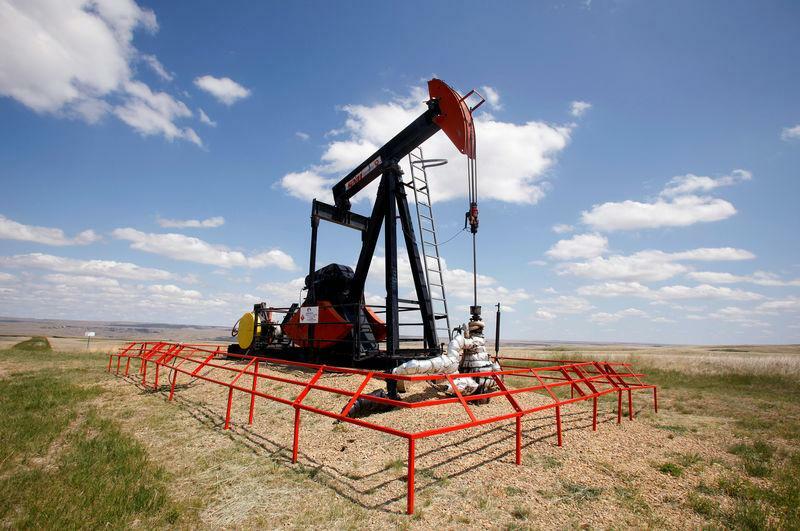 NEW YORK (Reuters) - Oil fell nearly 1 percent on Thursday, but held near 2019 highs, supported by a tightening of global stocks, OPEC production cuts and U.S. sanctions on key producers Iran and Venezuela. "The market is getting a little hesitant up at these levels," said Phil Flynn, an analyst at Price Futures Group in Chicago. Absent news events, the market will pull back, he said. As a result, Friday's U.S. oil rig count for this week will be closely watched as a forward-looking production indicator, he said. However, global trade tensions remained a worry. "Why are oil prices not rallying through the roof? We suspect the sword of Damocles hanging over the market is currently called U.S.-Chinese trade talks," Tamas Varga, analyst at brokerage PVM, said in a note. The market found some support in bullish U.S. employment figures. The number of Americans filing applications for unemployment benefits fell more than expected last week, pointing to still strong labour market conditions, though the pace of job growth has slowed after last year's robust gains. Crude prices have been pushed up by almost a third since the start of 2019 by supply cuts led by the Organisation of the Petroleum Exporting Countries, as well as U.S. sanctions against Iran and Venezuela. The drop in production has led to a tightening in global inventories. Consultancy JBC Energy estimated stocks had run down by a "solid" 40 million barrels since mid-January. U.S. sanctions are disrupting supply. OPEC will likely decide to extend its production-cutting deal with Russia at the organisation's next meeting in June, RBC Capital Markets said in a note. "With the driver of the OPEC bus, Saudi Arabia, showing no signs of wavering in the face of renewed pressure from Washington, we believe that OPEC is likely to extend the deal for the duration of 2019," RBC said. OPEC's crude output fell from a mid-2018 peak of 32.8 million barrels per day (bpd) to 30.7 million bpd in February. However, crude output production in the United States, the world's biggest producer, returned to its record of 12.1 million bpd last week.